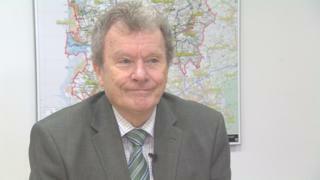 Devolution plans in Lancashire have collapsed after four councils refused to seek more autonomy for the county. Lancashire County Council (LCC) has now joined fellow Conservative-controlled authorities in Fylde, Wyre, and Ribble Valley in withdrawing from the process. LCC leader Geoff Driver said any attempt by the remaining 11 councils to press ahead would be "pointless". Many business leaders have warned that ditching devolution would be a missed opportunity for the county. Devolution would see the county make its own decisions on transport, housing, and parts of education. But, after two years of trying to make things work, the relationship between the 15 councils has fallen apart. Chorley Council leader and vice-chair of the Shadow Combined Authority, Labour's Alistair Bradley, accused some councils of "making excuses" for not taking part. He said: "We need to go with the majority view and the minority can't wreck the process." But, six months after celebrating taking control of the county council, Conservative Geoff Driver said any such attempt "would fall at the first hurdle - and the first hurdle is that every local authority has to agree to it. "We must move forward together, we must have a say in the Northern Powerhouse and that's what we intend to do." Business leaders are now worried Lancashire risks falling behind devolved areas like Greater Manchester and the Liverpool City Region. East Lancashire Chamber of Commerce chief executive Miranda Barker said ditching devolution was a "missed opportunity" and added: "The majority of our business and income comes from manufacturing. "The government needs to realise that investment here will reap benefits for the whole of the country."